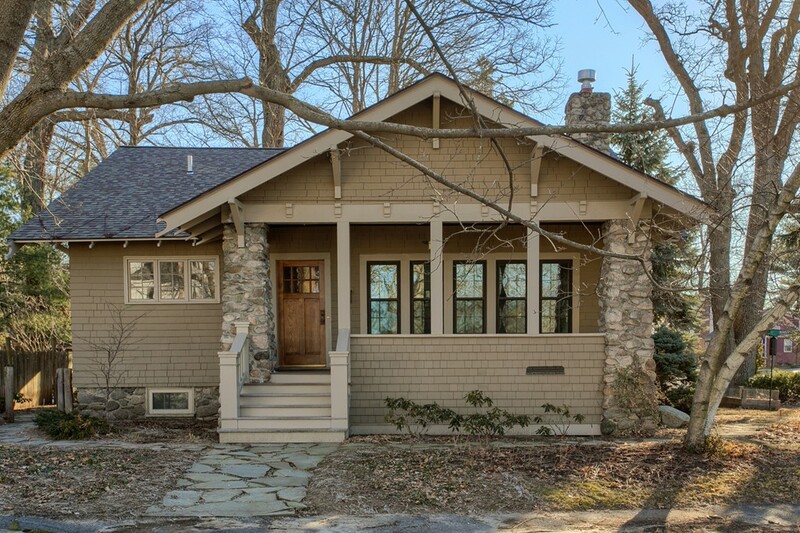 Quintessential arts & crafts style bungalow, loaded with character and charm, & recognized by the Andover Historic Preservation Commission. Original home was a Sears catalog bungalow, fully renovated in the 90's by architect & then owner Rob Bramhall. Front entrance & steps were renovated in 2015, & rear portico added in 2005. Great care taken to maintain the home's integrity and historic authenticity, such as kitchen columns tapered to match the exterior stone columns. 2nd floor with 2 BR & full bath were added at time of renovation. Newer kitchen has timeless appeal with warm cherry cabinetry & center island. FR with French doors & beautiful built-ins. Slider leads to lovely brick terrace, & don't miss the unique hand-crafted rosewood side door on garage and story to go with it! New roof in 2015 (house only); sheathing and electrical roof cables added to prevent ice dams. Some replacement windows, but originals that remain enhance appeal & charm of this very special home.